An entire boys soccer team in Thailand have been missing along with their coach inside a cave for over a week. 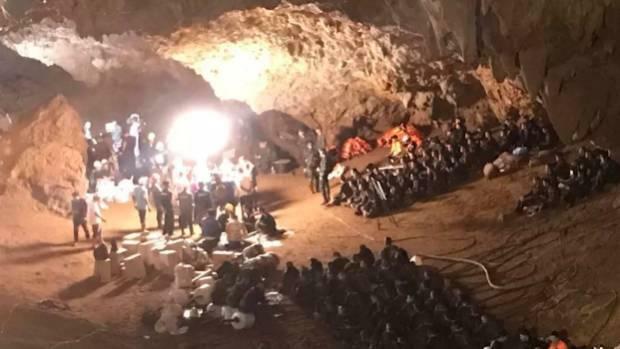 Now, Australian Federal Police and Defense Force personnel have been dispatched to the location of the cave to aid in the search for the 12 boys and their coach. A team of AFP Specialist Response Group members who are experienced in search and rescue and cave diving are on their way aboard a Royal Australian Air Force C-17 transport aircraft. Australia's foreign affairs, defence, and home affairs ministers issued a joint statement Saturday. The statement confirmed that Australia was working closely with the Thai government and Royal Thai Army to locate the missing group. An official has been sent by the ADF to the rescue command center in Chiang Rai as a Specialist Liaison Officer. The official will help provide operations and planning expertise to the rescue operation along with a Department of Foreign Affairs and Trade officer who was also dispatched. The soccer team consists of 12 boys ranging in age from 11 to 16 along with their 25-year-old coach. The team entered the Tham Luang Nang Non cave in Chiang Rai on June 23 but have had no contact since. Several bicycles found belonging to the boys were left outside the cave's entrance which is off limits. Thai navy divers, a US military team, and British cave experts have all been working round the clock despite the incessant rain that has flooded the cave making operations more difficult. Green Boat Emergency, a private Chinese group, arrived on Saturday. A member of the group named Wang Xudong said, "Our skills are search and rescue on mountains and in caves. We hope we can help." The now multi-national team of rescuers is on their seventh day of operations and have so far not made contact with any of the boys. Thai navy SEAL divers have been vital to the search but have been hampered by muddy water reaching the cave's ceiling. Chaiwat Dusadeepanich of the Department of Groundwater Resource issued a status update Saturday saying that his team has been drilling for two days and has found a small underground water source near the cave. "But the water flow rate isn't great enough," he said. "We would have to drill in deeper to get to the source, but at least we found it. Hopefully, we can start pumping out the well water by the end of today." National Deputy Police Chief Wirachai Songmetta added, "Yesterday our team climbed into one shaft, and went in around 50 meters" before splitting into two separate chambers.